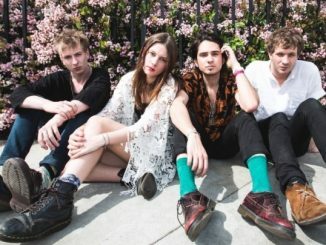 London’s Wolf Alice are pleased to announce their debut album My Love Is Cool with new single ‘Giant Peach’ – the first to be revealed from their debut album. Where previous single ‘Moaning Lisa Smile’ saw the band at their most powerful, ‘Giant Peach’ is another proposition altogether; launching in with a motorik groove driven straight from the autobahn, vocalist Ellie Rowsell sounds at her most confrontational yet, with an almost Siouxsie Sioux-esque snarl before the track’s groove takes an unexpected turn. With the four-piece already showcasing their ability to bend their sound on 2014’s Creature Songs EP, ’Giant Peach’ heralds another remarkable step for the group and a scintillating glimpse at what their Mike Crossey (Arctic Monkeys, Foals, Black Keys) produced debut is set to offer. Following a breathtaking, breakthrough 2014 that saw the group appear on the prestigious BBC Sound of 2015 long list, named as one of iTunes’ ‘Artists For 2014’, become the #4 most blogged artist of 2014 on the UK Hype Machine Blogs, winning Best Breakthrough Artists at the UK Festival Awards and touted by the likes of NME (Young Britannia – Future Of British Music), XFM (Great Xpectations) and Hype Machine (Ones To Watch), ‘Giant Peach’ is a huge signal and statement of the band’s intent. The arrival of ‘Giant Peach’ follows the band’s sold-out debut US shows in LA and New York, along with the news they will be appearing at Reading & Leeds Festival, 6Music festival, Longitude and SXSW, and comes ahead of the band heading out on headline tours on both sides of the Atlantic, including a special homecoming show at London’s Shepherds Bush Empire on April 3rd. My Love Is Cool will be released through Dirty Hit Records in the UK on 22nd June 2015.